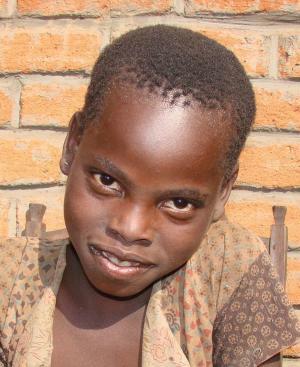 Luciano, who is now eleven years old, is the 6th born in the family of seven. He lost both parents when he was only four years old. But his grandmother and the rest of the family looked after him well. It took him time to realize he had no parents. This was because he was integrated into the family soon after the demise of his parents. If the child slept on an empty stomach it was because everybody else in the family had slept on an empty stomach. Meanwhile his grandmother is very weak and cannot cultivate the fields. She looks sickly. It is very hard for her to find food for the family. 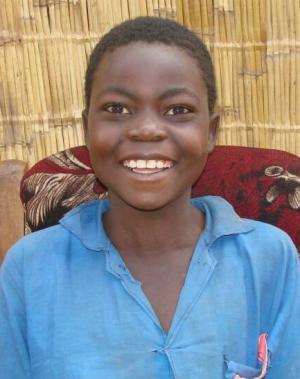 Being an orphan, Luciano lacks basic necessities for his upkeep such as good blankets, bedding, clothes, shoes etc. Willard lost his father at a very tender age. This is really painful. He is the 4th born in the family of five. He is 12 years old and is in grade 3. Meanwhile, Willard stays with his mother. In order to find money for the family she resorted to brewing locally made beer called Kachasu (20-30-70% ethanol). We appreciate the role of his mother as the bread winner in the family. On the other hand this locally brewn beer contains almost 99% alcohol. The kids have all the chances of trying to taste this. Gradually they may be addicted. This can greatly affect their performance at school. His mother sells the beer at Dzaleka refugee camp. We lost a child from Mfelakake on 18th Nov 2009. Her name was Fetina Rodgers. She was 6 years old and from Zindotsala Village. She went to water the crops in the company of her friends at her mother's garden. Their garden is just along the river. The cup which she was using for watering fell in the river. Because of some minor waves the cup was almost 30 cm away from her reach. In the course of attempting to catch the cup she slipped into the water and drowned immediately. Her friends were also busy doing other things as they were scattered and could not mind about their friend. When time came to go home they realized that one of their friends was missing. All what came to their minds was that possibly Fetina had already left for home. 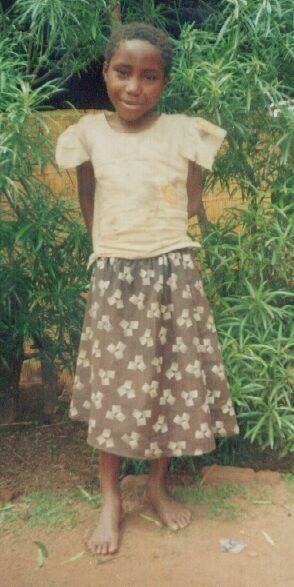 When the group reached home, Fetina's mother suspiciously noticed that her daughter was missing from the group. Her heart started pouncing heavily. She rushed to the river immediately and quickly only to find her daughter floating on the slowly moving river, already dead due to suffocation. It was a very sad moment. On the burial day the Village head advised the people not to allow the kids to the rivers alone without an elder accompanying them. 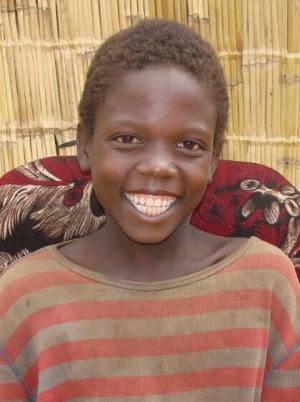 Colleta is now a 13 year old girl belonging to Mfelakake feeding center and is a very knowledgeable child. She was born in a family of seven members. But as far as education is concerned, Colleta only expects to have a poor vision of her education for the fact that she lacks some basic needs which can inculcate and lessen her education. Remembering the proverb which clearly stipulates that “there is no food for lazy people,” Colleta’s parents, whose poorness degree is beyond their control, try to carry out income generating activities such as doing some piecework for well to do families and selling tomatoes by using the little sum of money they get from tough and painful piecework. Additionally, Colleta’s parents also engage in fish selling by using door to door type of business, a thing which actually tends to be a risky prone activity health wise. This is so because her parents move long distances on foot to make sure that her goods are bought; a thing which can definitely create a gap for her body to be very tired and lead to the beginning of some diseases. Furthermore, Colleta wishes to become a teacher in the future and she thinks her dreams shall be true only if GCM Inc. humbly adheres to her social and professional crying by granting her some adequate basic needs so as to forge ahead with her education. These basic needs should among other things include the food she receives at GCM Feeding Center, along with a good blanket and school uniform. Lastly, her parents do not take for granted the normal feeding process that GCM Inc. undertakes at Mfelakake feeding Center. Meet Maria Chipelesa. 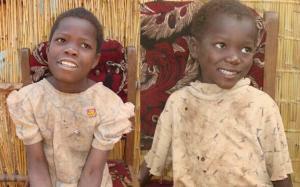 At only eight years of age this little girl travels three kilometers to get a nourishing meal provided by GCM. Her father passed away five years ago when she was three. Her mother collects fire wood from the forest to sell at Dzaleka Refugee Camp to earn her living. From Moyonsana village where she resides it's about five kilometers to the Camp. She manages to pick one bundle per day. One bundle is almost 1.00 US Dollar. Maria, in the family of five, faces many big challenges. She does not have good clothes to wear to school. She wishes she could have a new school uniform. If she wants to wash her clothes, she has to wait till they're dry and then put them on. This routine retards her performance in class. However, she is very thankful that GCM provides nourishing food to help her in her quest to realize her full potential. 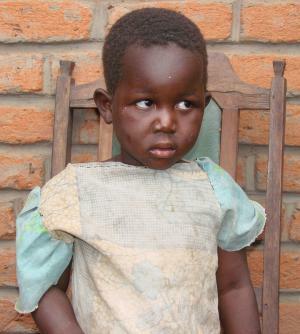 Maria is a typical child in Malawi. And it is children like her who will be future leaders. They must be given an opportunity! Eleven year old Chikumbutso Chibweza is one of the children at the Mfelakake location who may be the next Stephen Curtis Chapman, Michael W. Smith, Phil Keaggy, and Paul Baloche all rolled into one. He is a self-taught musician and made his guitar (what we would call a banjo). He of course plays by ear and composes songs also. His 5-year old brother Anderson plays the base which is almost bigger than he is but he lays it down while he plays it. On our last trip to Mfelakake Chikumbutso along with a 'group' performed for us with several songs. During one song Anderson was having trouble with the base. While playing and singing Chikumbutso moved his way to the front where Anderson was sitting and fixed the problem with the base as the group continued without missing a beat. Chikumbutso then proceeded to complete the song with the group. 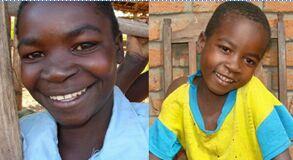 There are many talented children in Malawi that we pray will have an opportunity to reach their full potential. But if they continually struggle through school because of lack of nutrition then they may never see their potential reached. This is one of the many reasons we do what we do at Great Commission Missions. We met a five year old boy while walking in Misi Village. He ran toward us and then stopped. He waved and said, "thank you very much." We laughed and waved. As we turned and started back toward the feeding center, he came a little closer and once again waved and said, "thank you very much." Later that day he came to the center to eat. I smiled and said hello to "Mr. Thank You Very Much" and he smiled back. His real name is Bryan but we all call him "Mr. Thank You Very Much." We found out that someone taught him those words and he thought it was a greeting. Frank taught him to say "hello." After thinking about it, we decided "thank you very much" was a better greeting. "Thank you very much for caring about me" …… "thank you very much for telling me about Jesus"……. "thank you very much for feeding me"…….. "thank you very much for making me smile"………… Most of us need to say "thank you very much" more often than we do. Irene is a 10 year old girl, and Titani is her 5 year old brother. They come to the feeding center every day while they leave behind a smaller sister, Bertha, with their mother, as she goes about the daily routine to earn a meager income. They are pretty typical of most of the children that come each day around noon for a good nourishing meal. 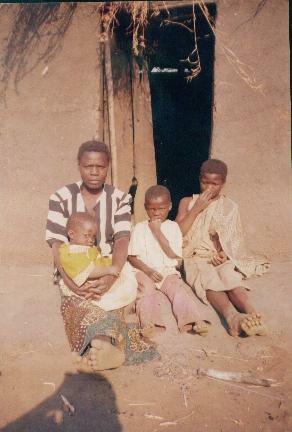 Their mother, Hannah Nyongolera, is 30 years old and has been a widow seven years now. Hannah has also had a mental deficiency for about three years in that she can not reason well. But she, like so many other mothers, does her best to take care of her children. Hannah collects wood from the mountain to be sold as firewood in the Boma (downtown Dowa) for their existence and travels about ten miles each day to collect and sell this wood. Recently we were informed that this family lost everything they owned in a fire that destroyed their home. It seems Hannah was going to start a fire on the veranda (that's a front porch consisting solely of dirt as is normally the case in Malawi) to cook what little meal she had. There was a small gust of wind that blew the fire into the grass thatching of the roof which then didn't take long to engulf the entire one-room complex in an inferno of heat. On our last trip to Misi village, we presented all the children at the feeding center with blankets, so they would have something to sleep on and help keep them warm. 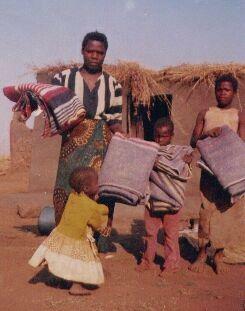 Irene and Titani were very upset when the fire destroyed there new blankets. A good-Samaritan neighbor assisted her with building a temporary shelter. Some of our local committee members helped provide some clothing for Hannah and the children. And of course, when we heard that the fire had destroyed everything including their blankets, we felt we needed to at least provide more blankets; one for each of the children and one for the mother. They are very thankful for the blankets. Even though this is such a small thing on our part, it is very important to them and they are very appreciative of anything we do for them. 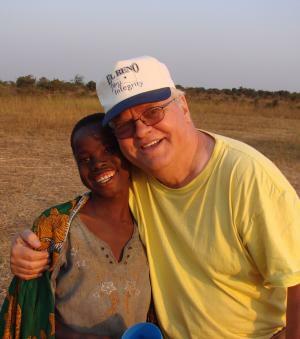 Note: Some articles were written by either our Malawi Coordinator or the local Teacher for the feeding center.